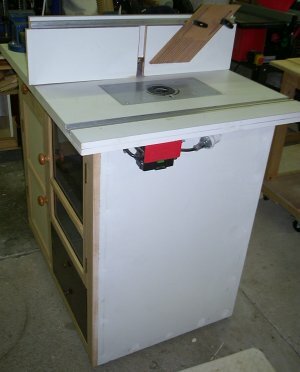 This is my homemade Router Table. Basically, it just a melamine cabinet but my choice of the Incra Ultralite fence forced a significant change to the design compared to traditional Router Tables. As you can see from the first photo, the working position is from what normally would be considered to be the side of the table. The reason for this is that the Incra Ultralite fence requires a very deep table which would have made the table way to big/deep particularly for my little workshop. 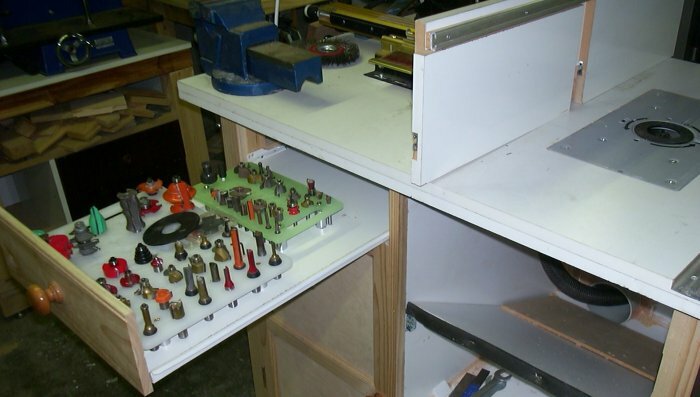 So as not to waste all the cabinet space, I choose to build drawers/cabinets in the side and the only thing on the "front" working position is the external power switch. This has proven to be a great design and provides some little added benefits (i.e. no door knobs to bang your knee against). Also, having the main door covering the Router enclosure on the "side" has also proved to be a benefit (surprisingly). This is when I am doing the initial setup and adjusting the bit height as I can position the fence and then place the piece of stock behind the bit. From the side position, I can sight down the fence, see the bit position in relation to the work piece. I have found this great for the initial setup as well as fine tuning later on. In this shot you can see my Router bit draw. The bits are held in two plastic breadboards I picked up from a discount shop. These work great and also prevent corrosion of the bit shafts. You can also see dust chute under the Router going to the 150mm (4") dust port which is connected to my Cyclone dust collector. Lastly, so as to conserve space, I chose to mount my Grinder and Metal Vice on the "back" of the table. Again, this has worked very well for me. However, doing so has force me to position the table in nearly the centre of the shop as access is need to three sides. This is fine really as it is in the best place for the area I have. 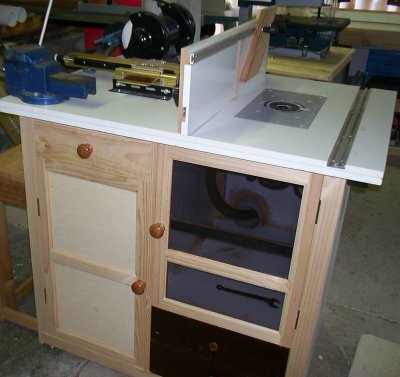 I am very, very pleased with my Router table and I don't think I would change anything if I built another.